Weaving – 2 sets of straight threads intersecting at right angles. Braiding and Twisting – threads are caused to intertwine with each other at any set angle. Knitting – forming yarn(s) into loops and inter-meshing the loops into a structure. Knitting is the simplest and most productive method of forming narrow fabrics. Knitting is faster than braiding and does NOT require the use of special yarn packages as do weaving, braiding and twisting. This eliminates the need to re-spool the yarn or wire onto special packages thereby reducing the total production time of the material. There are various ways the loops are formed and manipulated to produce unique knitted fabrics. The following is a general overview of the knitted structure and knitting terminology. Because of their inherent inter-meshed loop structure, knits are highly elastic especially along the vertical axis. The elasticity of the loops allows knits to be softer and thus more comfortable, an important consideration when using them in apparel products. In applications where stretch must be controlled or reduced, there are several techniques available to reduce the elongation of a knitted material. Knit materials are more resilient than other textile structures in that they can be bent or curved around a surface without being distorted. This property makes knitted materials ideal for use in gasketing products. Knit materials are also more porous than other textile structures. Although a material knit at a high “stitch density” can appear to be opaque, it would be possible for a gas or liquid to penetrate it. This same characteristic, however, makes knits ideal in applications where filtration and absorption properties are required. Depending on the type of knit structure, some knit materials can be unraveled from the ends. However, when cut along the vertical axis, a knit is more stable than a woven or braided material. An old rule in knitting was that knitting required a relatively fine, smooth, strong yarn with good elastic recovery properties. Today, that rule no longer applies as all types of fibers and materials have been knit into textile structures including fiberglass, Kevlar, and wire as thick as .015-inch in diameter. On some machines, wire can be knit at the rate of 4 to 6 feet per minute. When most people talk about narrow knitted materials, fashion terms are commonly used to describe the structure of the material. This is probably due to the fact that, initially, the most common use of such products was in the apparel sector of the textile industry. Fashion terms such as purl knit or shaker knit describe a visual effect on the material. However, the technical terms used below more accurately describe the knitted structure. WEFT and WARP are the two basic types of knitted structures, and all knit materials can be classified as one of these types or variations thereof. Each has individual characteristics that determine which is best for a specific application. WEFT or WARP knitting machines can be either flat or circular, single or double needle bed type. Multi-feed machines can be either WEFT or WARP, but only a WEFT machine can be offered as a single feed unit. Weft Knit – Knit structure produced when each yarn is presented in succession to every needle in the needle bed. In weft knitted loops, yarns freely flow horizontally from one loop to another – allowing a loop to distort easily if tension is increased on the material. This aids the form fitting and elastic recovery properties of weft knits. 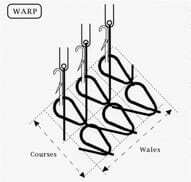 A weft knit produces structures where the loops are in straight wales, resulting in a smoother and tighter knit material. This is more difficult to achieve with warp knits. Warp Knit – Structure produced when each yarn is presented simultaneously to just some of the needles. Warp knitted yarns tend to have a somewhat vertical path through the material. This orientation reduces stretch along the vertical axis of the material. In addition, the interlocking of two different threads on a single needle in successive courses makes warp knits less likely to fray or unravel. There are 3 types of needles used in knitting machines today: the bearded or spring needle, the latch needle, and the compound needle. The bearded needle was the first type of needle used in knitting machines and is still in use today. The compound needle is the newest type and has been developed for special applications. The latch needle is the most widely used needle in narrow fabric knitting machines today because it uses the simplest type of mechanisms to form the loop and stitch. As stated previously, there are two basic types of knitted structures, WEFT or WARP. All knitted materials, whether flat or tubular, can be classified as either a WEFT knit or a WARP knit. Within these two categories, there are several types of knit constructions. A. Plain Knit – Material produced by a single set of needles. Other names for this type include single jersey, stockinet, shaker stitch and cable knit. B. Rib Knit – Material produced by two sets of needles. Other types of knit structures include sinker top, fleece, interlock and purl stitches. Due to the size limitations of small diameter circular machines, they cannot be used to knit materials incorporating these types of structures. The basic elements of a knitted material consist of the Stitch, Courses and Wales. The loop formed by a needle is called a STITCH. A loop can consist of 1 or more ends of yarns. The total number of stitches in any given square area of the material is called the Stitch Density. The lower the stitch density, the more open or looser the material will be. Likewise, the higher the stitch density, the tighter the material will be. The Stitch Density is the product of two factors, the number of WALES per inch and the number of COURSES per inch. A WALE is defined as the vertical column of needle loops in a material produced by the same needle knitting at successive knitting cycles. The horizontal row of loops produced by adjacent needles during the same knitted cycle is called a COURSE. The number of WALES per inch is determined primarily by the specifications of the Needle Cylinder (circular machines) or the Needle Bed (flat machines) and specifically by the number of needles per inch. The number of COURSES per inch is determined primarily by the length of the stitch. Certain adjustments can be made on the knitting machine to control the stitch length. Finally, in addition to the specifications and settings of any given knitting machine, the size and type of yarn(s) used to knit the material will also affect the stitch density and thus the properties of the material.